Schoonhetenstraat 123 Price asked € 309.500 k.k. Spacious lovely six / seven-room family house from a small-scale-under GIW guarantee built-new construction project (2002) 'Parc Overvoorde'. Located on the widest part of the pavement of a traffic-calm street, with many recreational facilities, schools, shops and public transport in the vicinity. Through front garden entrance house, very spacious hall with wardrobe, spacious modern toilet with hand basin, cupboard under the stairs and doors to spacious living room approx. 9.10 x 4.85 with modern open kitchen in U-shape with various stainless appliances: dishwasher, oven, microwave, 5-burner gas hob with wide chimney hood model, niche for fridge / freezer, aluminum sliding doors to beautifully landscaped, sunny back garden (15 meters deep) facing south with stone shed approx. 3.50 x 2.60 with electricity and gate to back entrance. Under the carpet lies a very nice herringbone parquet floor with dark piping. From hallway staircase to the top, with beautiful high windows, continuing to the 1st floor. Large landing, spacious front bedroom approx. 3.77 x 3.57, back bedroom approx. 2.71 x 4.96, intermediate modern bathroom with bath, separate shower, toilet and wash basin, back room approx. 2.06 x 3.75. Under the (loose) carpet of this floor is a laminate floor (with the exception of the front bedroom). Attic floor, fully equipped with laminate flooring and at the front 2 windows in the balustrade and at the front and back two large Velux skylights making this floor a very bright room. Currently divided into two rooms, leaving a cozy L-shaped bed-/work room at the back of approx. 25 m². The HR c.v.- combi boiler, the mechanical ventilation / heat recovery system (currently not used) and washing machine connection can be easily screened off to create a spacious bedroom at the front. There is also a possibility to easily create a second bathroom. Eternal lease-hold land which the rent charge has been bought off. Association of Owners contribution inside area € 120.00 per year. Electricity 5 groups with/without circuit breaker. Central heating system, HR, built in 2002. The condition of the kitchen and bathroom is good. The house has wooden window frames with double glazing. Modest front garden and deep beautifully landscaped sunny back garden approx. 15.00 x 5.00 with spacious and bright stone shed with electricity. In the near future Station Moerwijk, including the public spaces and Stationsplein will be refreshed to make this a well accessible public transport area with plenty of space for bicycles and pedestrians. Also the green zone at the Erasmusweg will be restored. Living surface approx. 152 m². The volume of the house is approx. 508 m³. 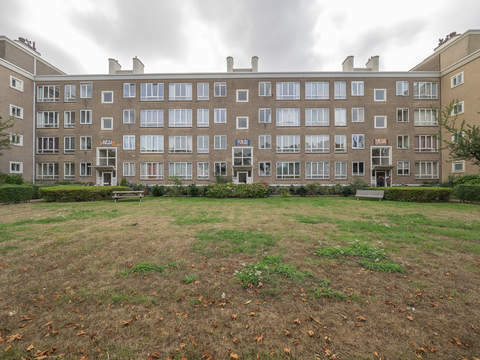 Within walking distance of shops of the Heeswijkplein and near shopping Leyweg. Near schools and cozy city park 'Zuiderpark'. Very convenient to public transport (tram16, NS station Moerwijk) and main roads.